June-August: Saturday-Sunday, 9am-5pm or contact museum for guided tour. Guri Neteland was born on the Neteland farm in Steindalen Valley on March 26, 1813, the only child of Olav Hakonson Neteland (1779-1841) and Helga Olavsdt Bjorke (1778-1869). Guri married Lars Endreson Rosseland in 1831. In 1857 Lars and Guri and their 7 children came to America, leaving one daughter Helga Lardst Rosseland. Lars and family homesteaded on Solomon Lake in Kandiyohi County, Minnesota, near Willmar. Lars and Guri completed their cabin in 1858. It is a one room house with a loft. They settled into life in Kandiyohi County by farming and enjoying their community; fellow settlers and the Dakota. In 1862, life changes drastically in Kandiyohi County and Minnesota because of the U.S. Dakota Conflict of 1862. The U.S. Dakota Conflict of 1862 was a six week long war (August 17 –September 23) between the Dakota Indians and white people of Minnesota. It is one of the most important events in Minnesota’s history. On August 21, 1862, a group of Dakota came to the Endreson cabin. Lars Endreson and son Endre were slain in cold blood outside the home. The second son, Ole, who was inside the cabin was wounded and left for dead. Two older girls, Guri and Brita, were taken captive. In the meantime Guri with her baby Anna in her arms witnessed the terrible scene but escaped the attention of the Dakota by hiding in an old cellar hole obscured by tall weeds. When the Dakota had departed and believing that all was lost and not knowing that son Ole was in the cabin, Guri covered the bodies of her husband and son Endre and with her baby in her arms, set off to try and reach Oscar Erickson’s Cabin, her son-in-law. She became lost in the darkness and after an agonizing night she returned to her cabin. Here to her great joy she found her son Ole, wounded in one shoulder – but alive. Together the mother and son buried the dead where they had fallen. They then found two of their oxen which they hitched to an old stone sled and set off for the Erickson cabin again. It was torturous travel midst constant fear of the Dakota again attacking. On approaching the Erickson cabin they saw no sign of life. Ole crept close to it, saw a rifle protruding out of a window. He heard what sounded like a voice. It did not sound like one he knew. Could be that of Dakota? So they left the scene and spent the rest of the day going from one cabin to the other in the area but finding them all deserted. In the evening they returned to their own cabin again and there spent the night. The next morning Guri turned her face to the task again. Perhaps the voice that Ole had heard at the Erickson cabin was really that of her daughter or her son-in-law. So again the oxen were hitched to the sled and again they found themselves at the Erickson cabin. Ole bravely approached the cabin and peered into a crack between the logs. A familiar voice called more loudly to him this time-it was that of Mr. Erickson. They entered the cabin and found Erickson and a neighbor, Solomon Foot, terribly wounded and helpless. The two men had lain there for two days and nights, in oppressive heat, plagued by insects and near death. Guri washed and dressed their wounds and cleaned them up. A wagon was found on the place to which the oxen were hitched. Guri and Ole carried the heavy and helpless men and laid them in blankets in the wagon box. Again they set out eastward, mother and son, taking turns leading the slow moving oxen. From one deserted cabin to the other they trudged their way with fast disappearing hope that they would ever find survivors. After a harrowing two-day, terrible journey, they finally reached the county line and Forest City 15 miles beyond. Here were gathered the settlers who had fled their cabins. Here also Guri, to her great joy, found her two daughters who had escaped from the Dakota and been found by a search party and brought to safety. The girls had made their way through the country a distance of ten miles into Lake Elizabeth Township. After clasping the girls to her heart, Guri’s first words were – “Give me something to do. I must have work to occupy my mind or these dreadful memories will unsettle my reason.” Twenty five white persons, and an undetermined number of Dakota were killed in Kandiyohi County. Guri Endreson did eventually return to live at her home. In the summer of 1866, she went to live with neighbors, the Sjur Anderson family. Guri later returned to the cabin and lived with Anna and Brita. By 1870, Guri and Anna were here alone, Guri at age 58 and Anna age 10. By 1880, Guri was living with her daughter and son-in-law, Gertrude and Oscar Erickson, in the cabin. Guri Endreson died in 1881. The Endreson house has been listed on the National Register of Historic Places since 1986. It is architecturally and historically significant as one of our area’s oldest extant buildings on its original site, a rare survivor of the “pre-Uprising” (Dakota Conflict of 1862) period. One of the few buildings still standing that has strong historical links to the events of the Conflict of 1862. 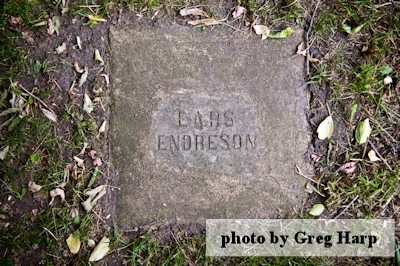 A state monument to Guri Endreson is located at the Vikor (Solomon Lake) Lutheran cemetery on County Road 5. West out of Willmar on Highway 12, then 4 miles north on County Road 5 (30th Street N.W. ), then west on 67 Avenue N.W. turn left at directional sign, and continue to follow directional signs.